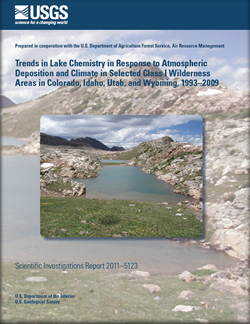 In 2010, the U.S. Geological Survey, in cooperation with the U.S. Department of Agriculture Forest Service, Air Resource Management, began a study to evaluate long-term trends in lake-water chemistry for 64 high-elevation lakes in selected Class I wilderness areas in Colorado, Idaho, Utah, and Wyoming during 1993 to 2009. The purpose of this report is to describe trends in the chemical composition of these high-elevation lakes. Trends in emissions, atmospheric deposition, and climate variables (air temperature and precipitation amount) are evaluated over a similar period of record to determine likely drivers of changing lake chemistry. Sulfate concentrations in precipitation decreased over the past two decades at high-elevation monitoring stations in the Rocky Mountain region. The trend in deposition chemistry is consistent with regional declines in sulfur dioxide emissions resulting from installation of emission controls at large stationary sources. Trends in nitrogen deposition were not as widespread as those for sulfate. About one-half of monitoring stations showed increases in ammonium concentrations, but few showed significant changes in nitrate concentrations. Trends in nitrogen deposition appear to be inconsistent with available emission inventories, which indicate modest declines in nitrogen emissions in the Rocky Mountain region since the mid-1990s. This discrepancy may reflect uncertainties in emission inventories or changes in atmospheric transformations of nitrogen species that may be affecting deposition processes. Analysis of long-term climate records indicates that average annual mean air temperature minimums have increased from 0.57 to 0.75 °C per decade in mountain areas of the region with warming trends being more pronounced in Colorado. Trends in annual precipitation were not evident over the period 1990 to 2006, although wetter than average years during 1995 to 1997 and drier years during 2001 to 2004 caused a notable decline in precipitation in the middle part of the record. Many significant trends were evident in lake-water concentrations in the study lakes. About 70 percent of lakes had significant trends in specific conductance, pH, calcium, and sulfate concentrations, whereas less than 20 percent had trends in chloride and nitrate concentrations. Despite widespread declines in sulfate deposition, decreases in lake-water sulfate concentrations were mostly limited to lakes in the Zirkel/Flat Tops Mountains. Because sulfate in these lakes is derived primarily from atmospheric sources, lake chemistry in these two areas appears to be responding to regional and local declines in sulfur dioxide emissions. Many lakes showed upward trends in sulfate concentrations as well as acid neutralizing capacity and calcium concentrations. Upward trends in dissolved constituents appeared to be partly explained by a decline in precipitation between 1995 and 2002, which may have increased base-flow contributions to some lakes. Air temperatures, which increased throughout the region, also may have been a factor in lake-water chemical trends. Warming in alpine areas might increase rates of mineral weathering or cause enhanced melting of ice features such as permafrost, rock glaciers, and glaciers. The effect of melting ice on the chemistry of the study lakes is difficult to assess due to the unknown extent of permafrost as well as a lack of detailed hydrologic data. The notable increases in sulfate concentrations may indicate that warming is enhancing the rate of pyrite weathering, perhaps related to availability of oxygen. Another potential effect of warming might be to increase the frequency of freeze-thaw cycles in alpine areas. This mechanism might provide a possible explanation for the increases in acid neutralizing capacity in addition to sulfate that was observed at many of the lakes. Mast, M.A., and Ingersoll, G.P., 2011, Trends in lake chemistry in response to atmospheric deposition and climate in selected class I wilderness areas in Colorado, Idaho, Utah, and Wyoming, 1993–2009: U.S. Geological Survey Scientific Investigations Report 2011–5123, 44 p.